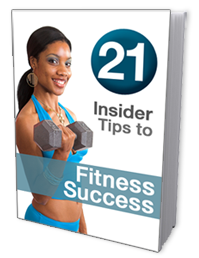 Get Faster Results From Your Workouts – Download This Free Report Now! Share Fitness The Right Way! Click on this button above and put us on your Facebook, MySpace, share us with all your friends and friendly apps! Ok, so last edition's question was a bit of a trick one, I admit it. The question was: "What is the best exercise to do to facilitate weight loss?" Answer: The one you like to do. In my experience a person is more likely to continue doing an exercise that they enjoy than one they do not have much affinity for, but do it because they think they should. There are definitely exercises that burn more calories than others, but again if you do not like doing those exercises then you are not very likely to stick with doing that particular form of exercise. Holding on to the handles or supporting your weight in any manner when you are on an aerobic* exercise machine reduces the overall amount of calories* you burn. The reason for this is that when you support your weight with your arms the large muscles of the lower body are then not moving as much weight and thus you get an overall effect of fewer calories burned. You see, the more weight you move against gravity, the more energy it takes to move that mass or load. The best analogy I can make for this is when you load weight in a truck it will then use more gas in order to be able to transport that load. So the moral of the story is that when you are on the treadmill or Stairmaster or elliptical trainer, try not to hold on to the hand rails unless you absolutely feel you have to in order to maintain your balance. This will result in more calories burned throughout your entire workout and thus more potential weight loss. *Definition: "Aerobic" means with oxygen. Aerobic activities are activities that require oxygen as an energy source in order to perform them i.e. Stairmaster or walking. *Definition: A calorie is a unit of heat or energy. Click here to see the next Coaches Corner.